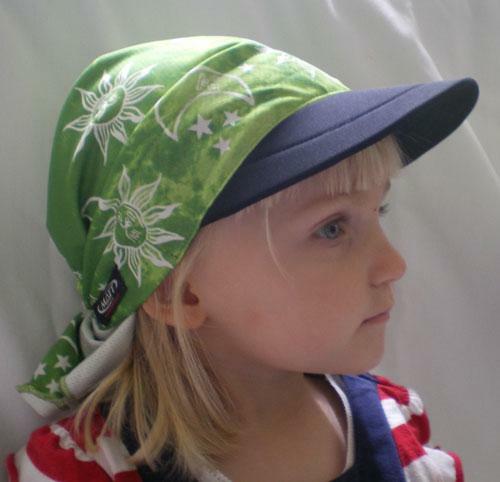 Pirate Cap with visor is ideal for both kids and adults. Fits by tying the triangular shaped scarf at the back. The CoolMax Fresh fx material is great for keeping you cool and protecting you from the sun. The Pirate Cap is made with Coolmax® freshFX technology which is designed to keep you cool and dry, and help prevent odours. It has superior moisture management, dries faster and surpasses competitive fabrics in the comfort index rating. It is proven to reduce skin temperature and lower heart rate and it meets the highest ADVANSA standard for performance certification. The pirate cap ties at the back and can be worn a few different ways.